Online Stock Brokers can be a great resource for everybody, and not just for the professional trader. For the beginer investor the low cost of commission makes it possible to start buying and selling of stocks while still learning the intricasies of the Stock Market. Just take a look at some other advantages of using an online broker and of conducting online stock trading. Convenience - While this is only one of the positive points of online stock brokers, it's certainly one of the biggest. Having a stock broker who is only available during the day may be okay for some people, but most are working, dealing with family and handling other commitments during "normal" business hours. Finding time to make contact with stock brokers who have only daytime office hours can be a real hassle. But online stock brokers are available 24-7, even when the stock market is closed. Even when they're not physically sitting at their desk (and many of them won't be except during regular hours), you can leave e-mail, place orders and make plans for trades. Perhaps you're a night owl and you do your best thinking, planning and analyzing in the wee hours of the morning. With an online broker, you can do your stock trading when it's right for you. Instant information - Most online stock brokers have some serious data at your disposal. They're used to doing business by e-mail and are going to have lots of stock market data available at any given moment. It's in writing - If you've ever wondered what you might have told your broker in a moment of "enlightenment," online trading could be just what you need. There's no need to fret over whether you told him to sell at $25 or to sell 25 of your stock - you can simply go back to your e-mail and see what you told him. 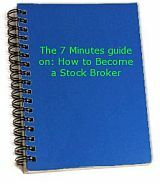 Instant communication - With an online stock broker, there's no need to stop what you're doing and run down to his office to sign a form to authorize the trade. Typically, your e-mail is confirmation that you approve the transaction. So is that to say this the the only way to invest in stock market? Despite the advantages, it's not all positive. There's a decided lack of the "personal touch." You may trust your stock broker to make good decisions on your behalf because you know your broker. It's difficult to gain that kind of relationship with a person you never meet. Security of online trades are typically high, but that all depends on the broker, the company, the website you're working from and even your own computer connection. Costs may add up before you realize it. Dropping an e-mail to authorize a trade is so easy that some people may drop them right and left, never realizing how much trading they've done until the bill comes due. Be sure to keep careful track. It's easier to be the victim of a scam. When you're visiting a stock broker's office, you know that he has staff, have probably checked out the diplomas and certificates on the wall and know what the broker looks like. Anyone can set up a realistic website and start collecting money for bogus trades that they never make - or worse, take your personal information and make their own trades on your nickel. There's no doubt that online stock brokers have made it easier for many to effectively handle a stock portfolio. Taking time to check out your broker will ensure that it's a positive experience for you as well. Return from Online Stock brokers to All About stockmarket Home Page.